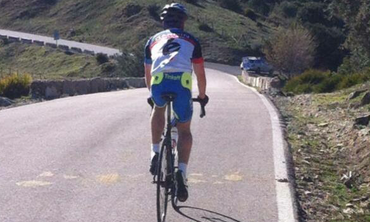 An average day of cycling would begin at 10 am, biking though the Andalucían countryside with your guide. Stopping for lunch and returning to Osuna at about 4pm. Depending on your ability and preference, the groups are interchangeable. The best organisation of the groups will allow you to be free to ride at your own pace, providing an enjoyable cycling experience. 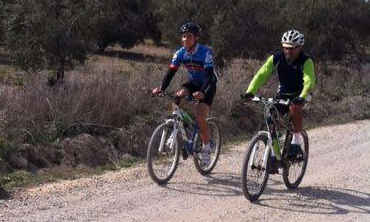 Mountain trail biking is a great opportunity to explore the beautiful Andalucían countryside. Biking along quiet tracks where you are only likely to meet a farmer or goat herder along the way. Routes lead to nearby towns where you will stop for lunch. Also Via Verde routes are included (old railway tracks). Depending on your ability and preference, the groups are interchangeable. The family and leisure cycling holidays give you the chance to pick your distance and terrain type dependant on the ages and ability of the group. Over the holiday, the distance and terrain type can be changed as confidence is increased. This allows you to go at a pace you are comfortable with to ensure you enjoy the leisurely ride. Andalucía has a variety of safe, quiet single track trails through beautiful countryside and undulating olive groves. There are plenty of opportunities to stop at local towns or villages for refreshments throughout the day. 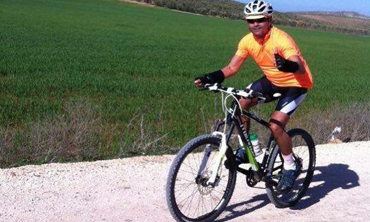 The wonderful mild Andalucían climate is excellent for cycling and exploring. I really can’t rate our Hola Cycling Tours holiday high enough. There were so many elements that made this an outstandingly good trip but the most important one was the people. Joss, his Dad Malcolm and Mum Angela, were both the perfect hosts and terrific company. It felt like being away with friends who have invited you stay at their beautiful home rather than ‘clients’ on a tour. Natural, genuine, down to earth, kind and with a terrific sense of humour, this lovely family are what make an Hola Cycling Tours trip stand out from the crowd. Add in the spectacular location of this truly Andalusian town of Osuna and a wonderful variety of cycling terrain, mouth-watering Spanish tapas and sunny Spanish weather and you’ve got all the ingredients for cycling holiday perfection. Cycling Whether you want hard, challenging training-camp style climbs or gently rolling “I’m on holiday’ spin-outs, there are endless options for cyclists of all levels and abilities. And best of all? The roads are so quiet! No Majorca-Mecca with hundreds upon hundreds of other cyclists crowding the routes. The countryside around Osuna offers all the cycling thrills of the honey-pot destinations but without the hoards. Joss is an accomplished cyclist (bit of a machine to be honest) although laid-back and really friendly, who can match those wanting full-on training rides but will also listen to his group and offer rides that suit what their looking for; no feeling of pressure to be going hell-for-leather if that’s not your thing. Malcolm and Angela are both handy on a bike too joining or leading some of the rides when the group wanted to split and making them terrifically social too. Plenty of stops for café con leche, cake, lunchtime tapas or a post-ride cerveza. Accommodation The town-house in Osuna is absolutely beautiful. It’s been renovated to an incredibly high standard by Malcolm and Joss (both are builders, which explains why!) The bedrooms are large, airy and comfy and you’re made to feel welcome using the kitchen and living areas. The bathroom is most probably better than your own at home! And there’s use of the washing machine to give your sweaty sun-cream soaked cycling gear a freshen up. And after a long, hot day in the saddle, the perfect tonic for tired muscles – a soak in the terrace-top Jacuzzi with stunning views out across the town before heading out to one of the numerous tapas bars to top up your calorie count for the next day. The rooms are comfortable and the facilities available in the Town House are great. We loved the town itself it has plenty of bars and restaurants to choose from - the hosts give great recommendations about where to go. The cycling holiday was completely customised to what we wanted. It was great and we could change each day and opt for - an easier day if we were a little stiff from the day before; or a harder day if we were feeling confident. Great cycling holiday. Very reasonable price. Thanks again.